Room rates do not include TAX (13%) and are per room/per night. Room rates include breakfast buffet. Children under 12 years that share a room with 2 adults stay free of charge. Maximum 2 children free in each room. A third child pays USD 10 + tax additional fee. We require all reservations to be fully paid (100%) 30 days before arrival at the lodge. 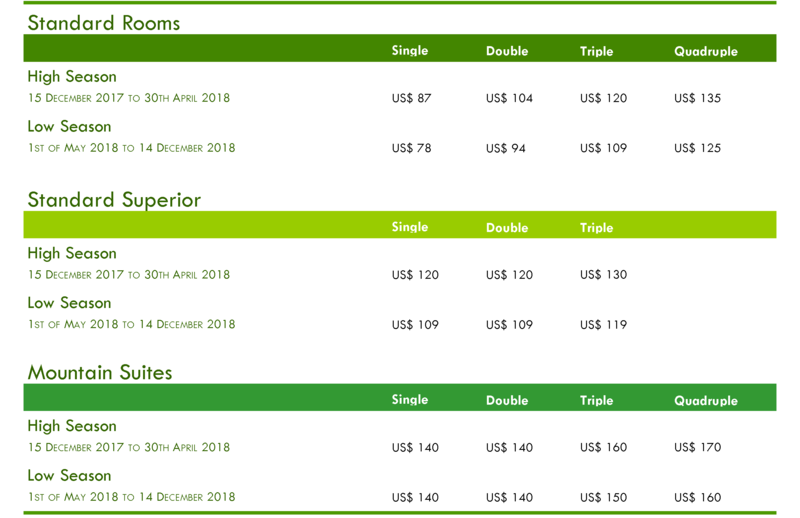 We require a minimum of 25% of total reservation to be deposited (to guarantee reservation) if this is made more than 30 days before check-in date. Reservations are guaranteed by a copy of the deposit statement or other proof of payment. This should be forwarded to the lodge by fax or e-mail, stating clearly the name of the client, date of entry and of leave and amount paid. For deposits ask for one of the hotel’s bank accounts. Reservations are also guaranteed through a correctly filled-in and signed credit/debit Card Authorization form, that the client has to return to the hotel by fax or e-mail. We also accept payments in cash, in US dollars, Colones or Euros. Cancellations with more than 30 days of anticipation: we will refund 75% of your reservation. Cancellations made from 30 days to 15 days before date of arrival at the Lodge, are subject to a charge of 75% of the total reservation. Guayabo Lodge assumes no responsibility should client cancel for any reason, including sickness, death in the family, natural disaster, conflict of war, or any other circumstance.